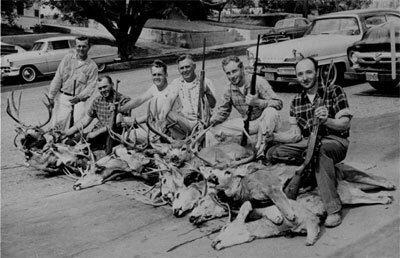 Pictured is my father, Melvin S. Chikato (pictured fifth from the left) and his brother Steve (first on the left) and friends after returning from their 1959 deer hunt in Western Colorado. This photo appeared on the sports page of the Los Angeles Examiner in October of that year. They hunted the area known as Piceance Creek located between Rifle and Meeker, Colorado in the late 1950s and early '60s. At the time, the area was home to the largest migratory mule deer herd in North America. Hunting was the best it would be in the century, and some years the deer were so numerous that hunters could purchase four deer tags each. My father killed many deer in his life, and most of them with his trusty Winchester MDL 64 30-30 rifle with open sights, seen in this picture. Dad and I returned to the area in 1995 after 30 years, and hunted it for four straight years. We took only one mediocre buck in that time. The area is now overhunted and mismanaged by the Colorado Department of Wildlife. Unfortunately, I must now return to Colorado without my hunting partner. My father passed away in January after a short struggle with cancer. Fortunately, he got to see me kill my first bull elk last October near Hayden, Colorado, during our last hunt together. I would like to dedicate this picture to his memory and to all the old hunters out there who remember the Good Old Days.